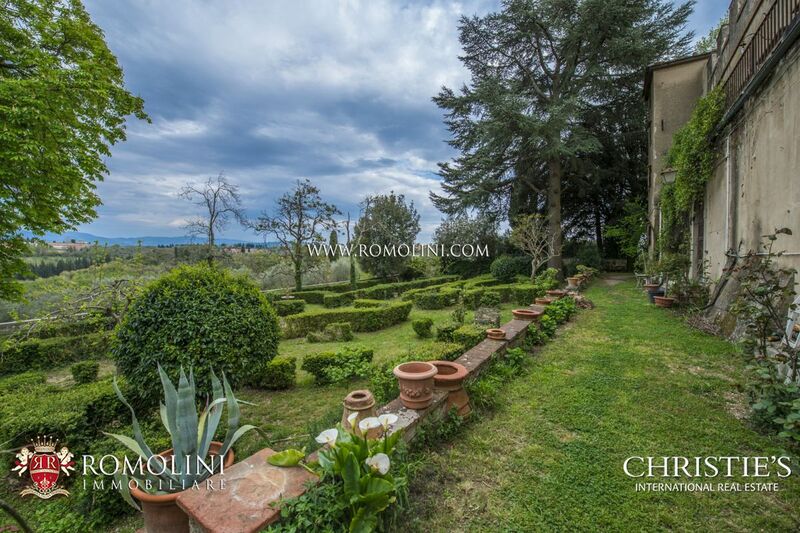 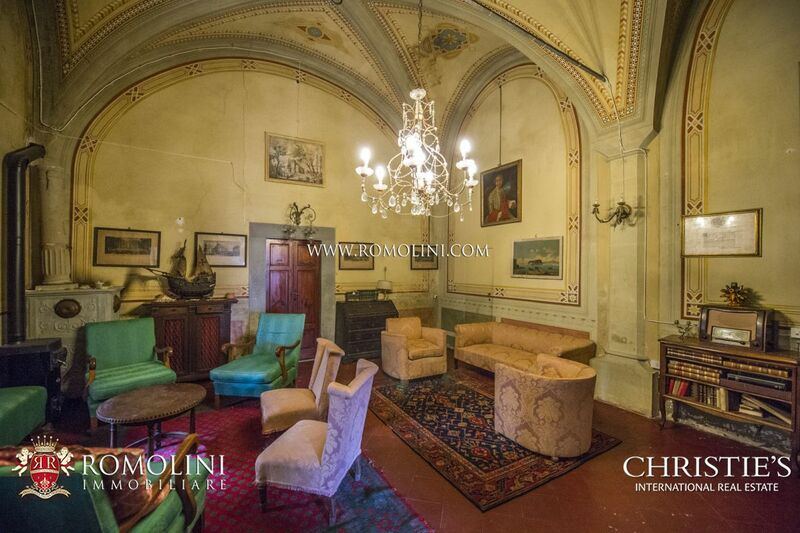 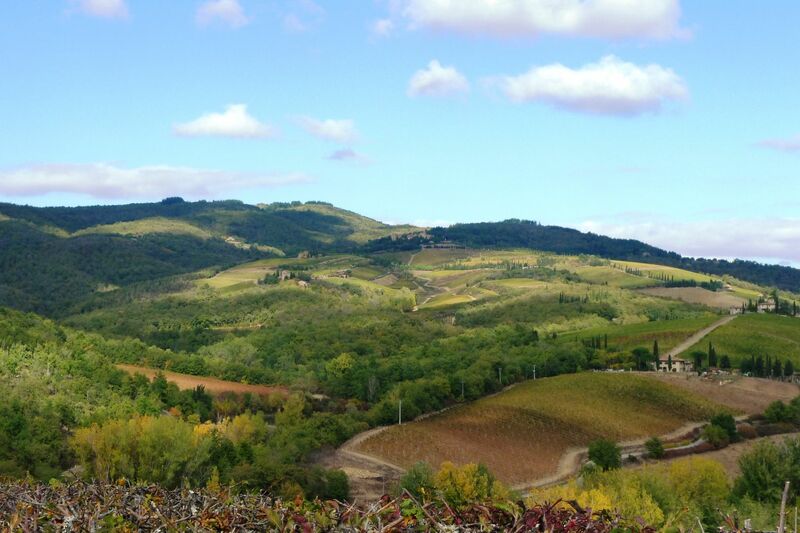 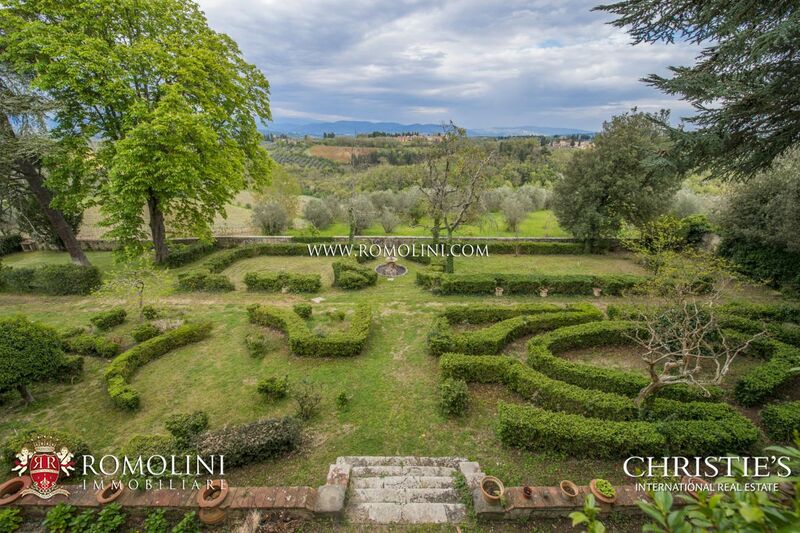 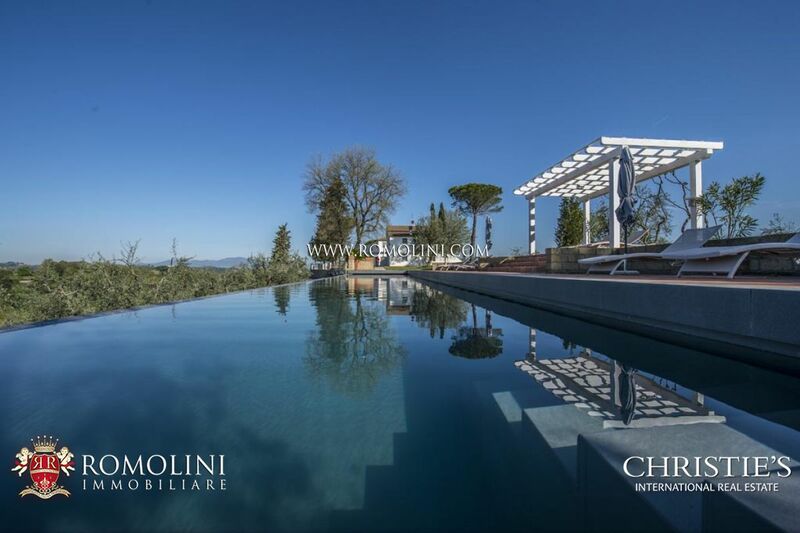 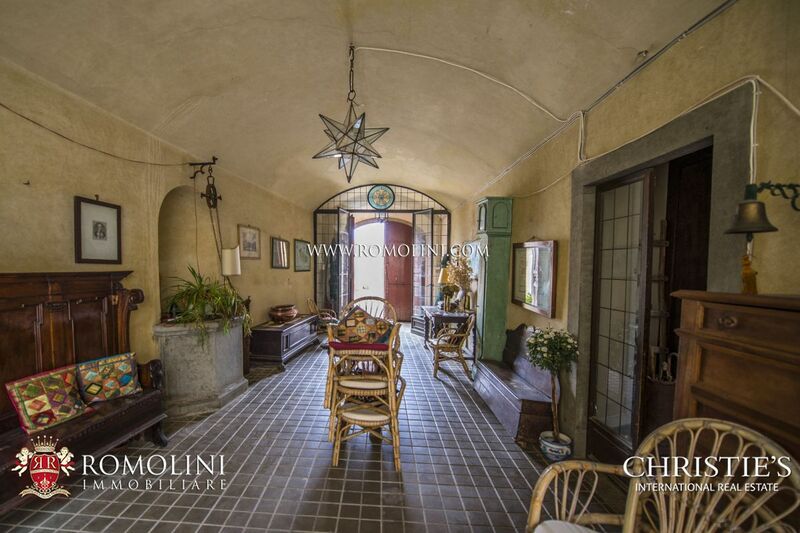 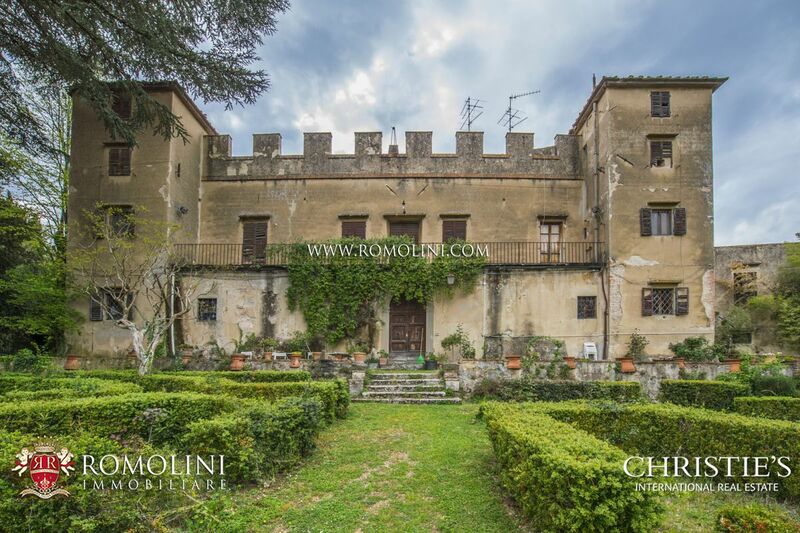 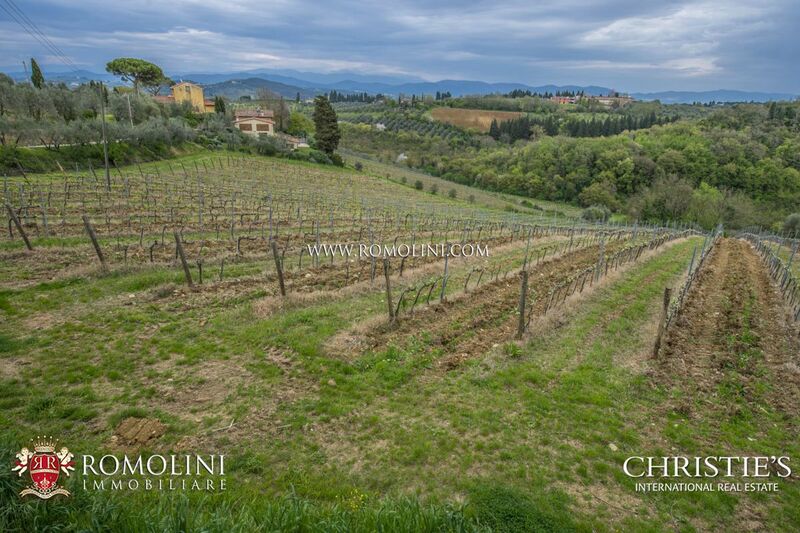 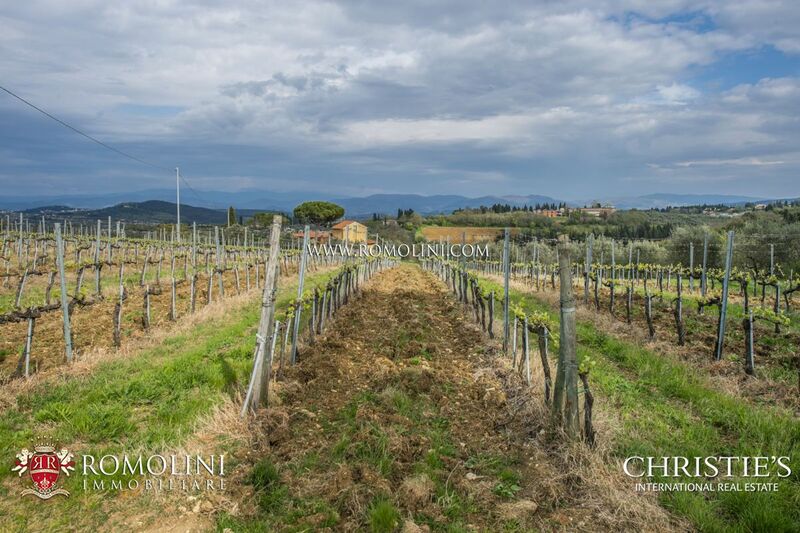 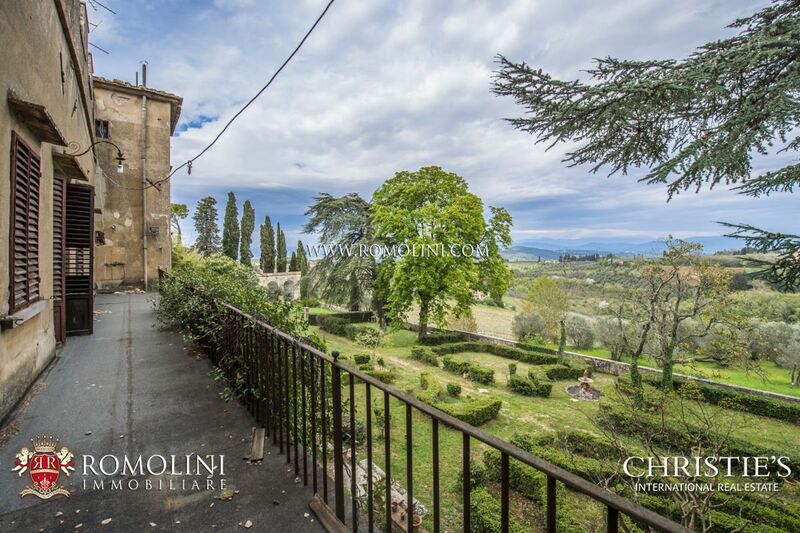 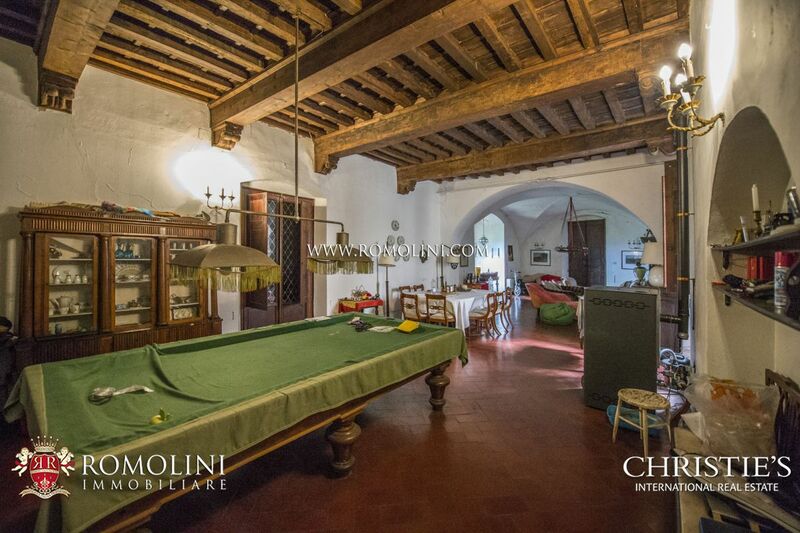 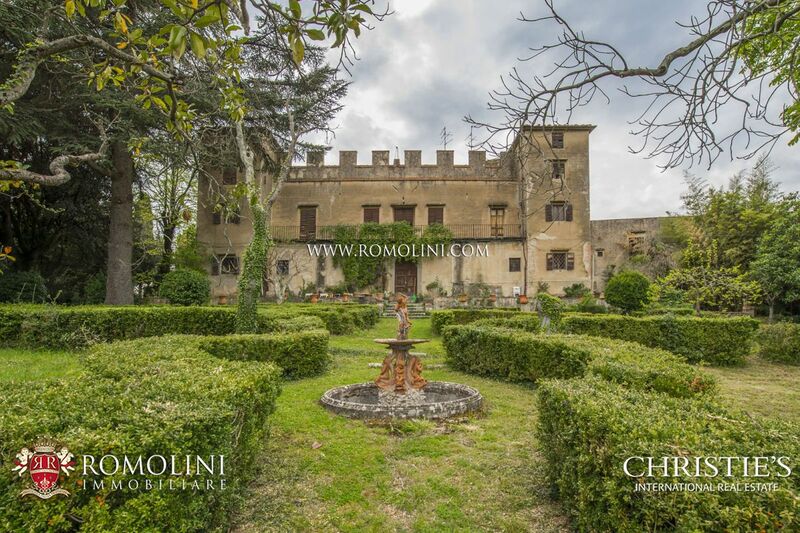 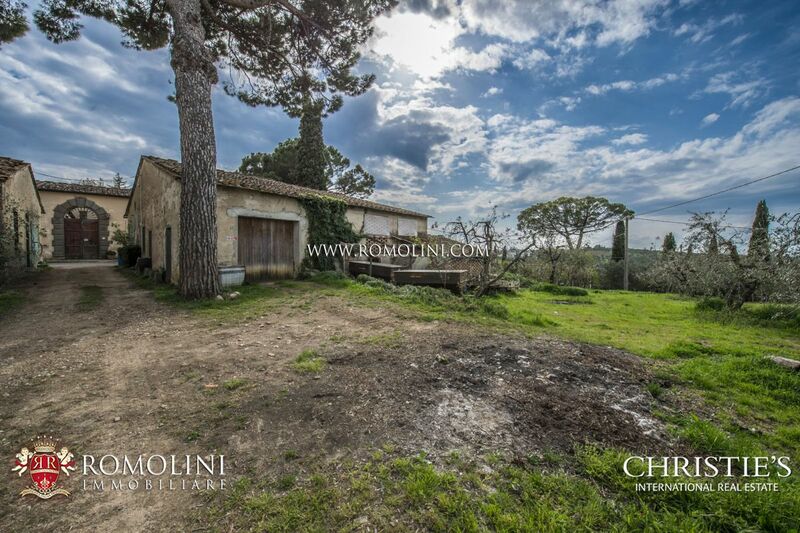 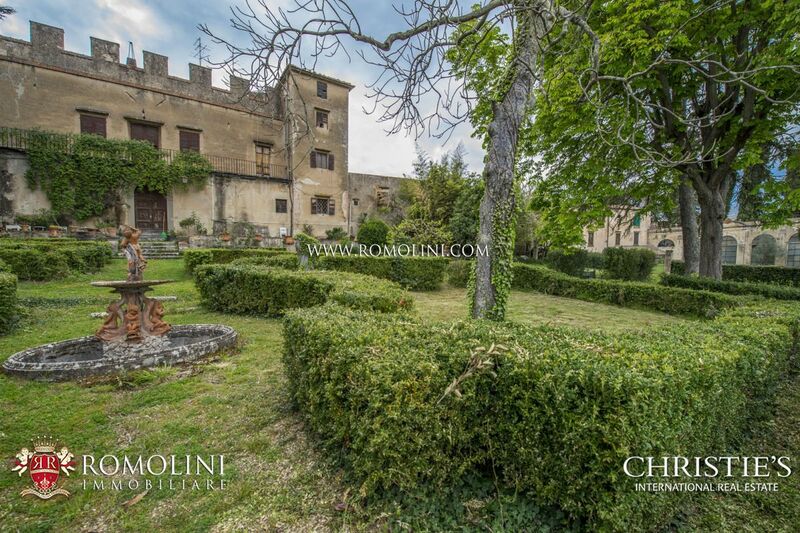 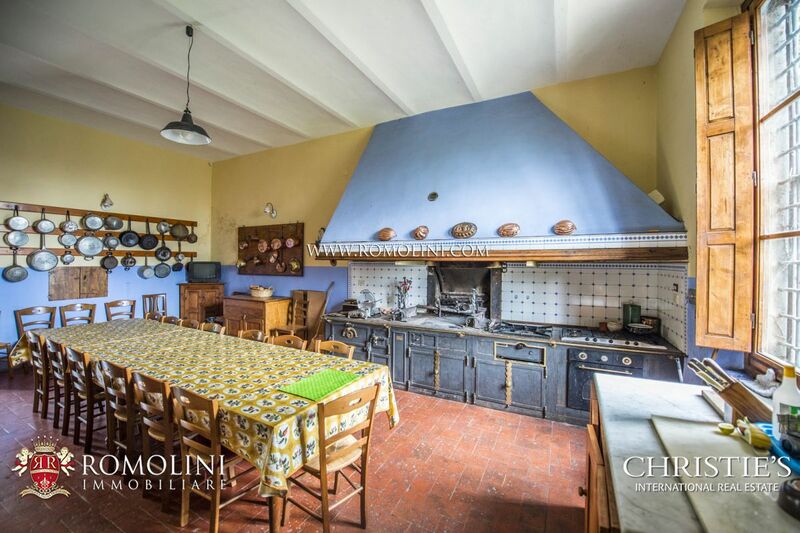 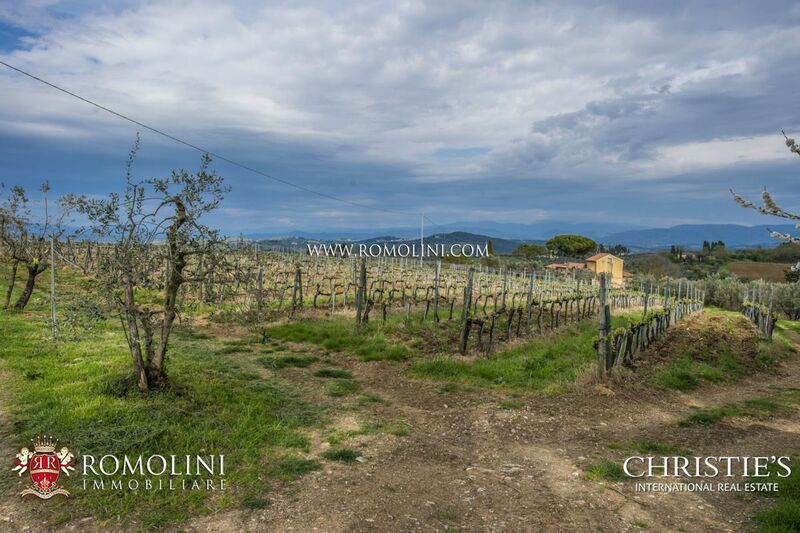 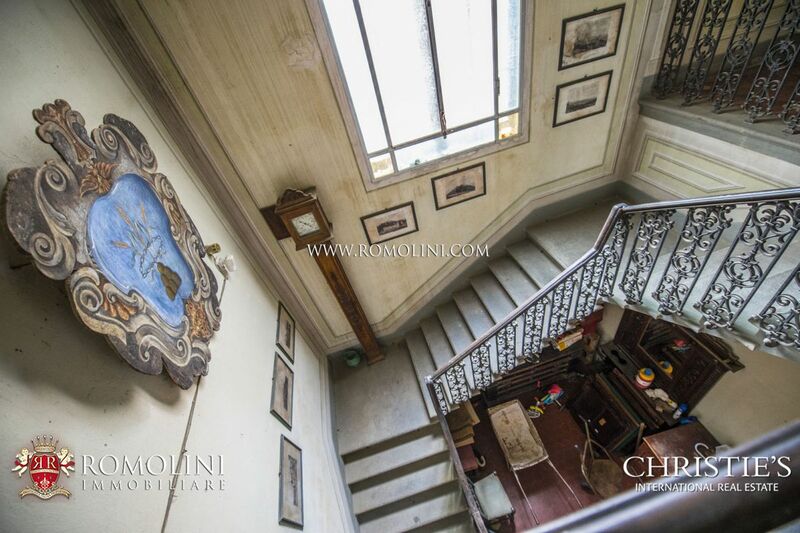 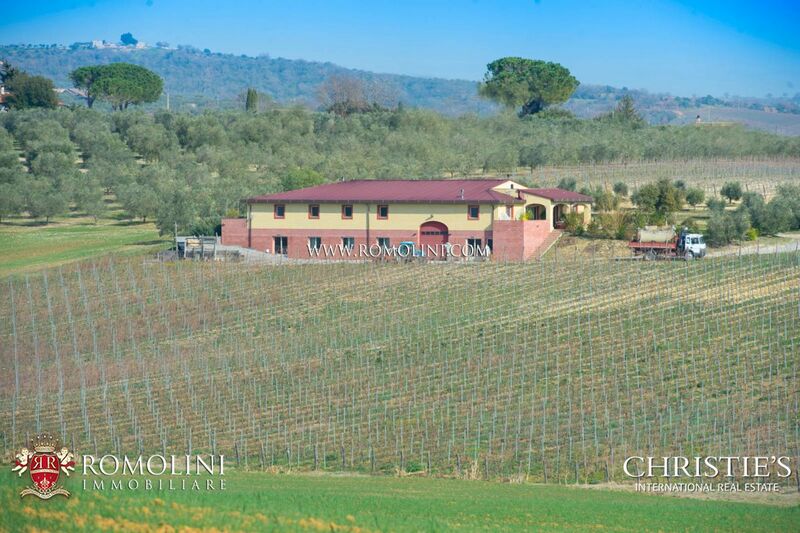 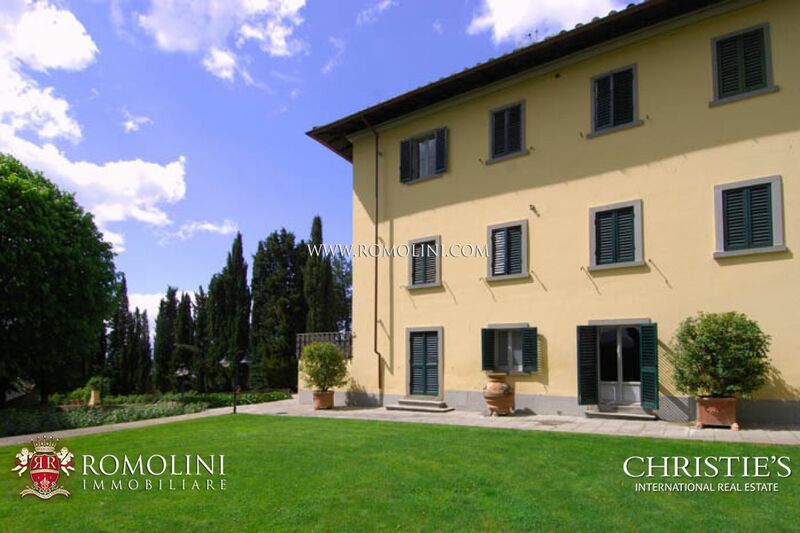 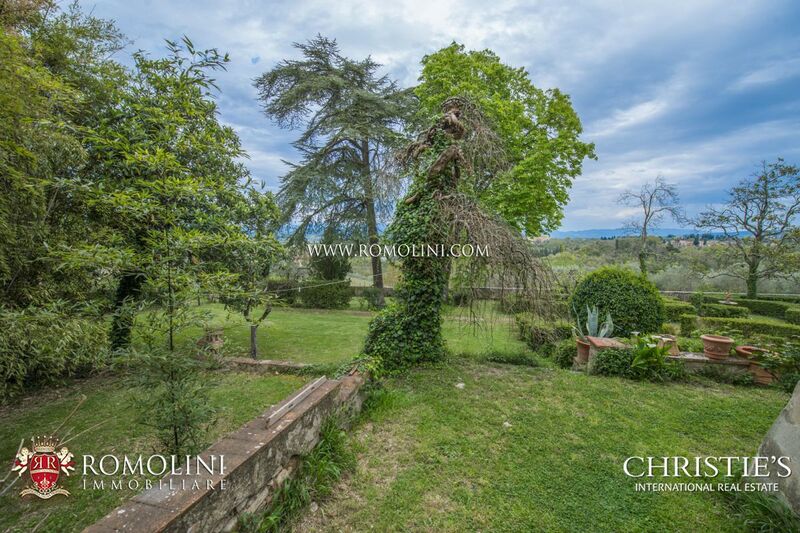 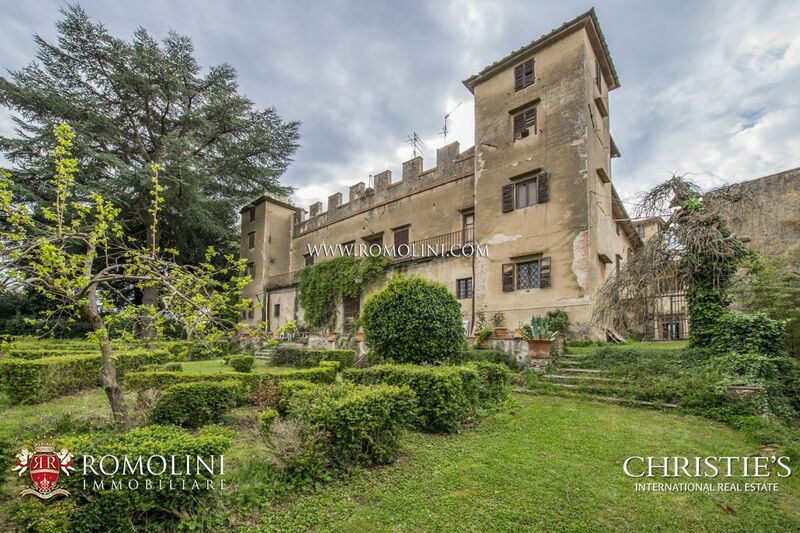 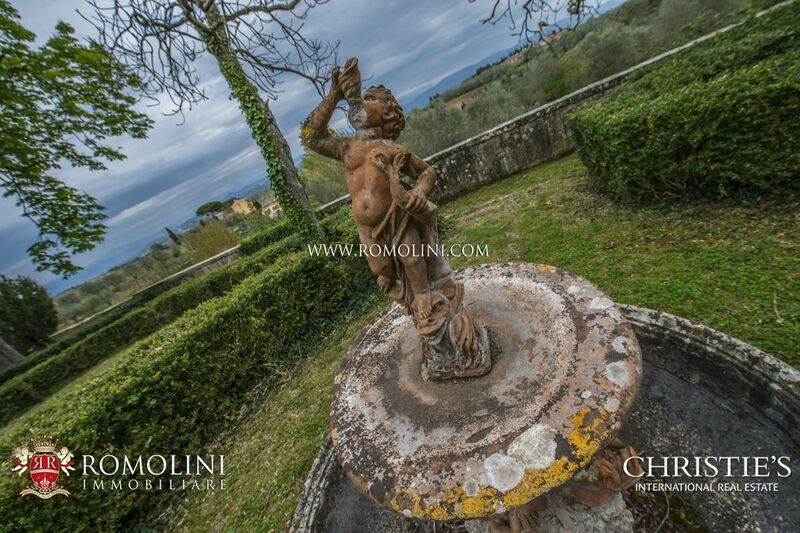 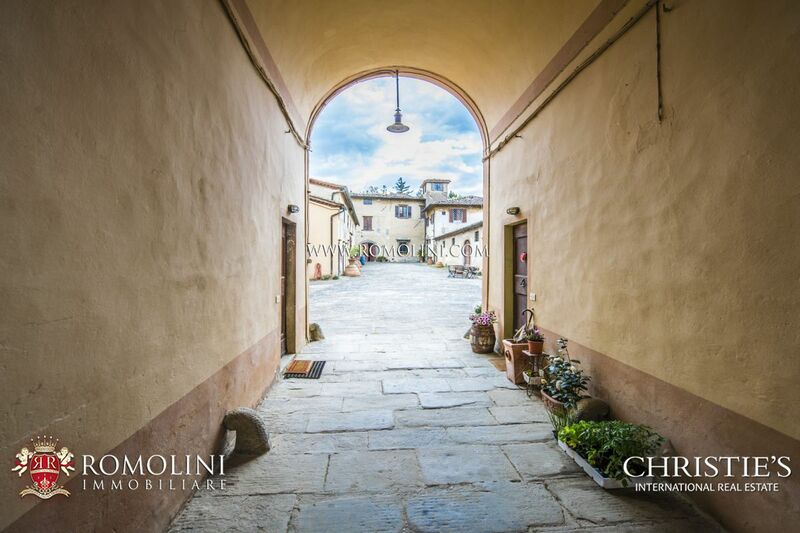 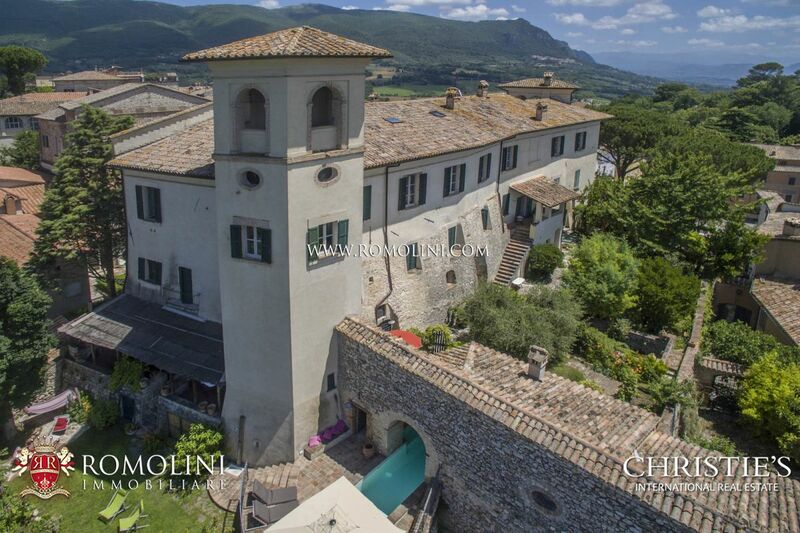 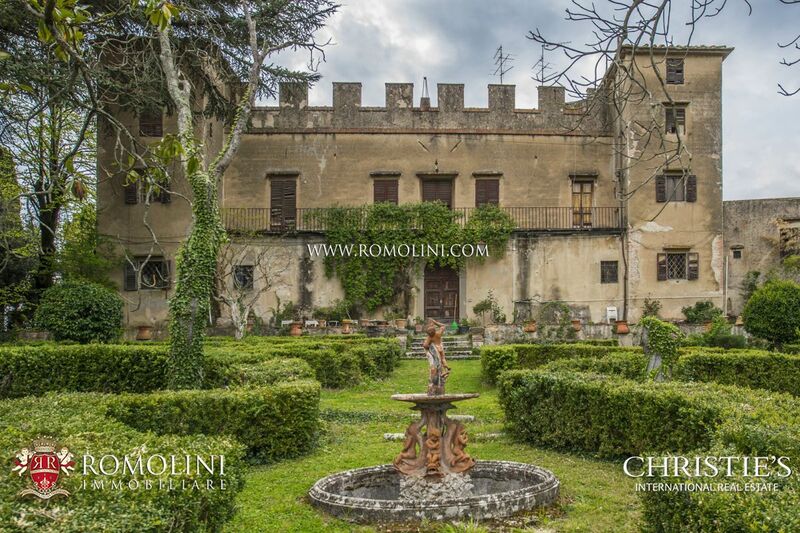 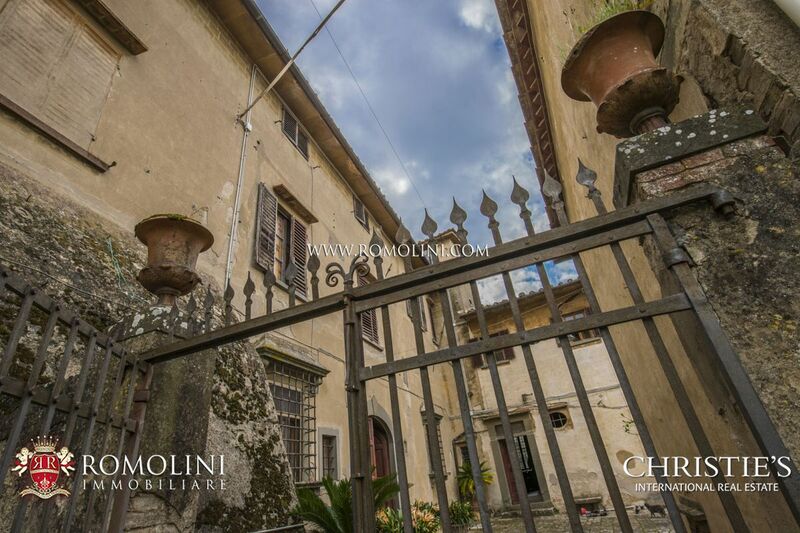 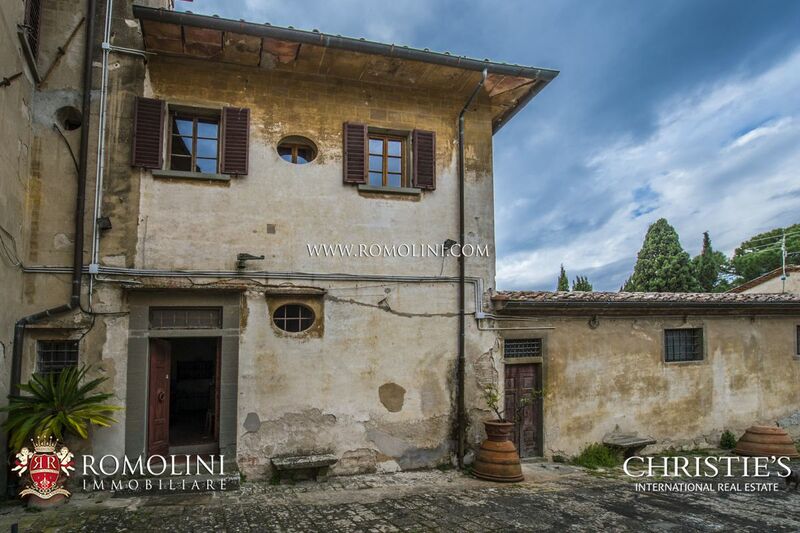 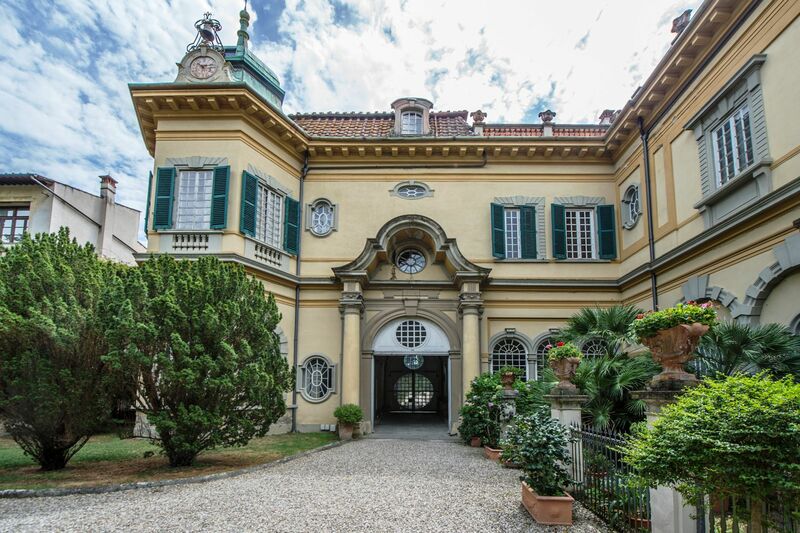 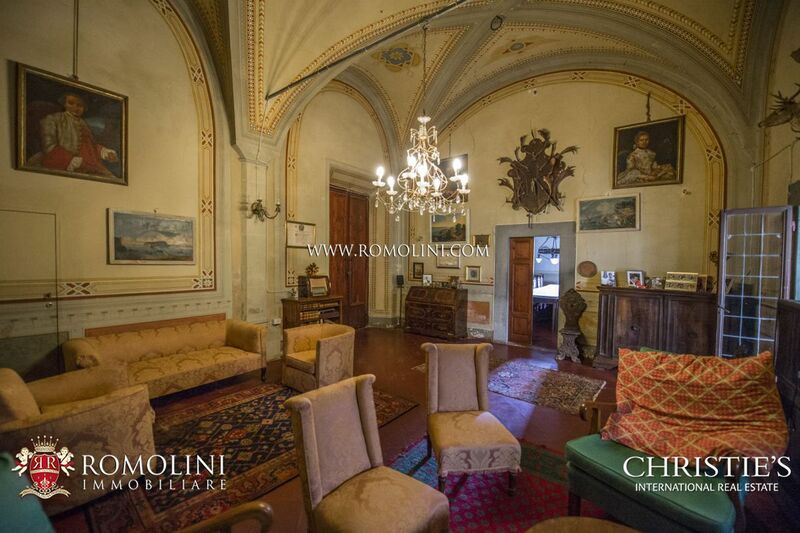 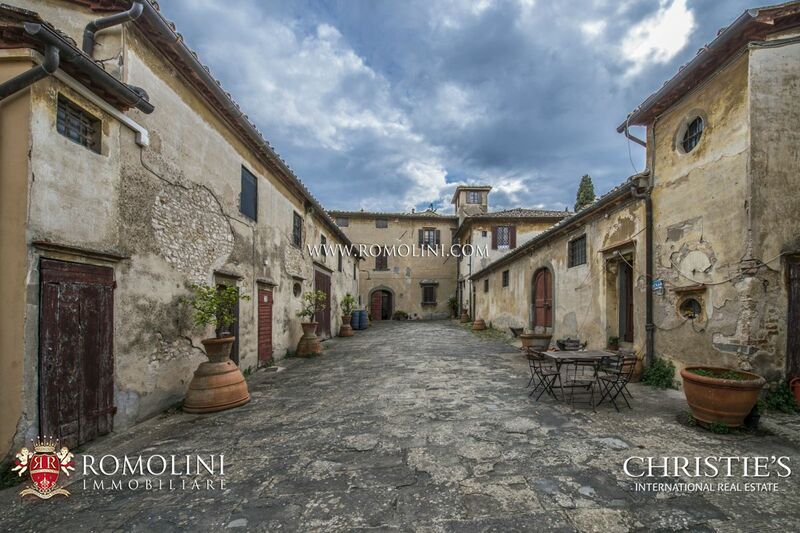 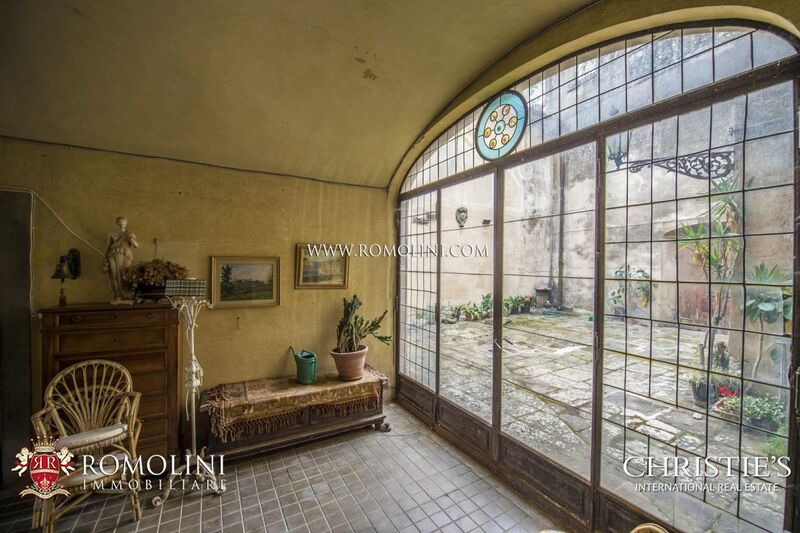 In the heart of Tuscany, a short distance from the city where the Italian Renaissance started, Florence, historical luxury manor villa dating back to the late Middle Age (13th and 14th century) with hamlet and 2 hectares of land. 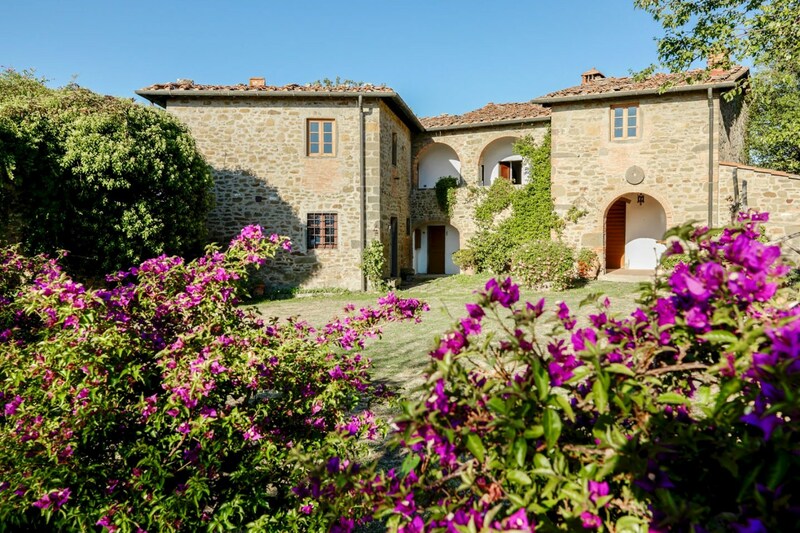 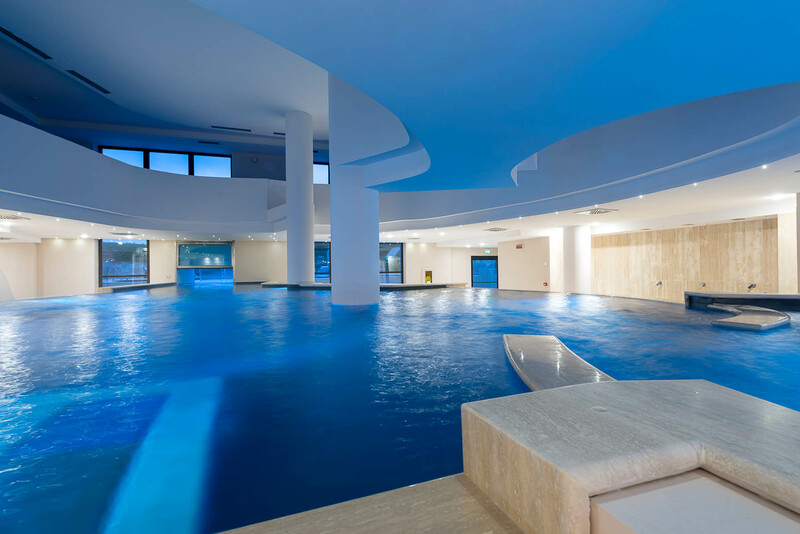 In the outskirts of a small town providing all the necessary services (1km; 5’), this impressive complex is located in a perfect location both for those looking for a quiet but not-too-isolated life and for those eager to visit the rest of Tuscany: the beautiful Florence (23km; 40’), the turreted San Gimignano (43km; 45’), the medieval Siena (65km; 1h), Pisa with its famous Tower (81km; 1h 15’), the wine-cities of Montalcino (99km; 1h 30’) and Montepulciano (114km; 1h 30’) and the papal Pienza (121km; 1h 40’). 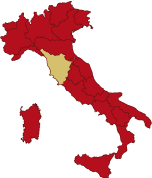 Closest airports to the property are Firenze Peretola (28km; 30’), Pisa Galilei (78km; 1h 5’), Bologna Marconi (111km; 1h 30’), Perugia Sant’Egidio (164km; 1h 55’), Roma Ciampino (292km; 3h 5’) and Roma Fiumicino (307km; 3h 5’). 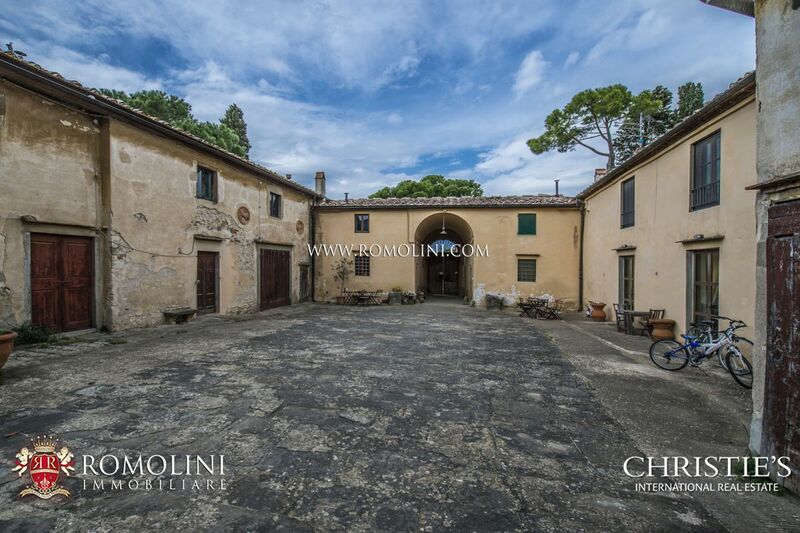 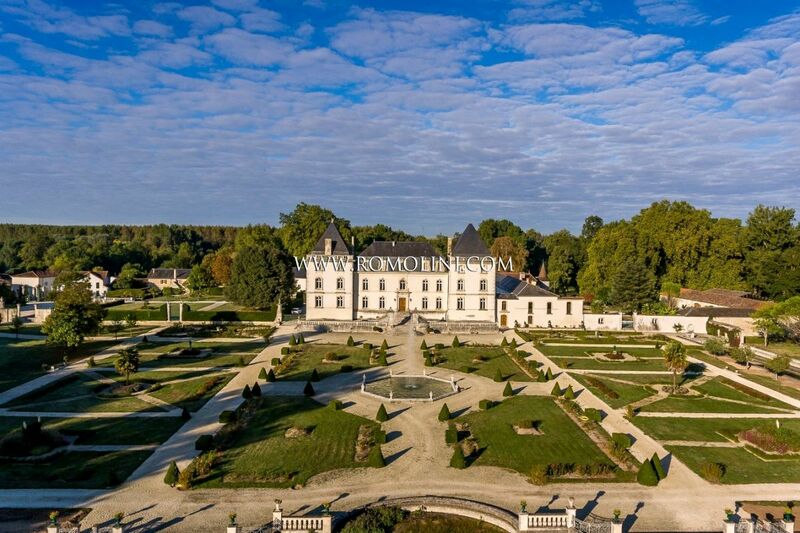 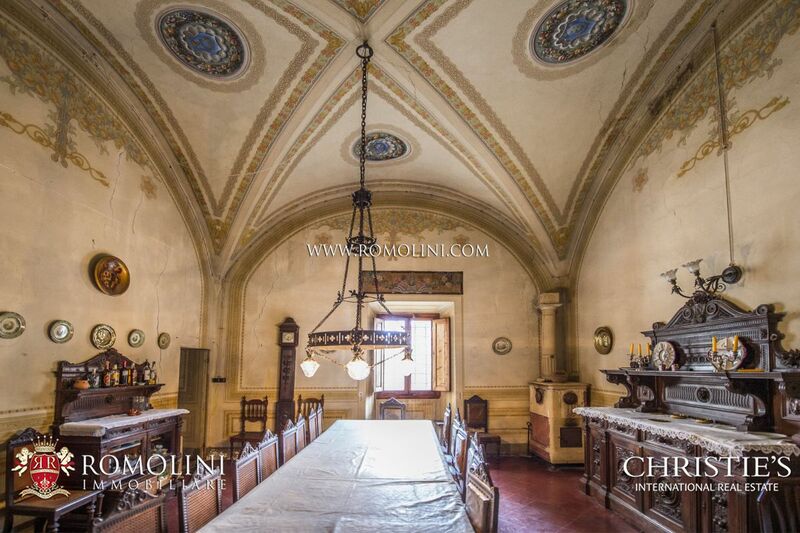 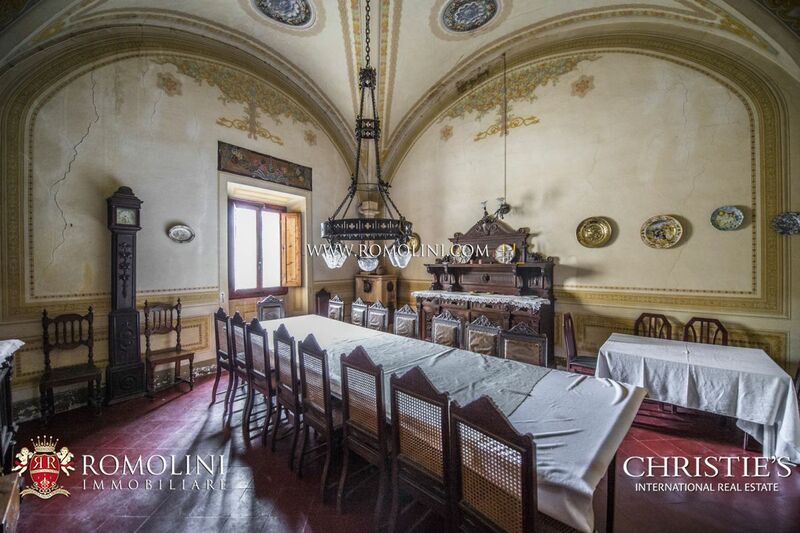 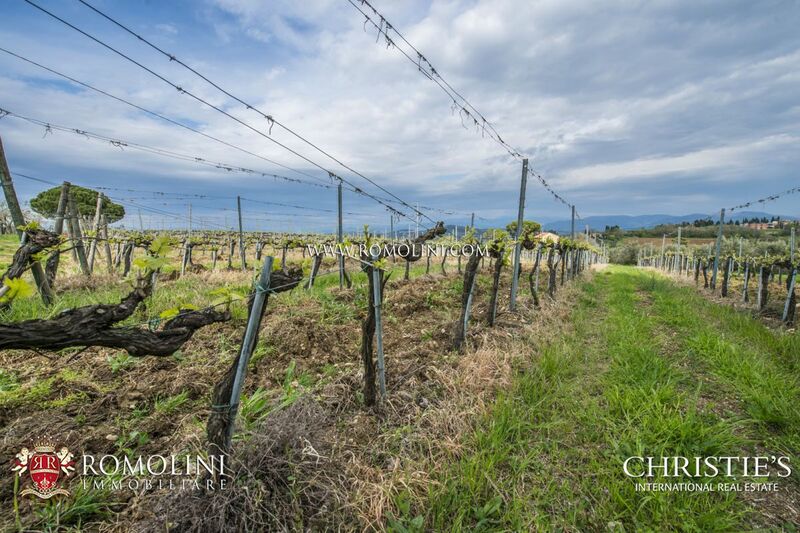 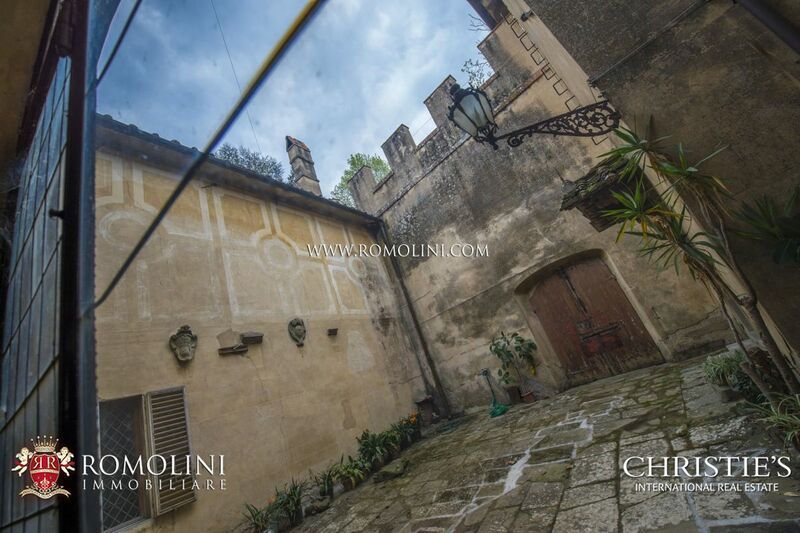 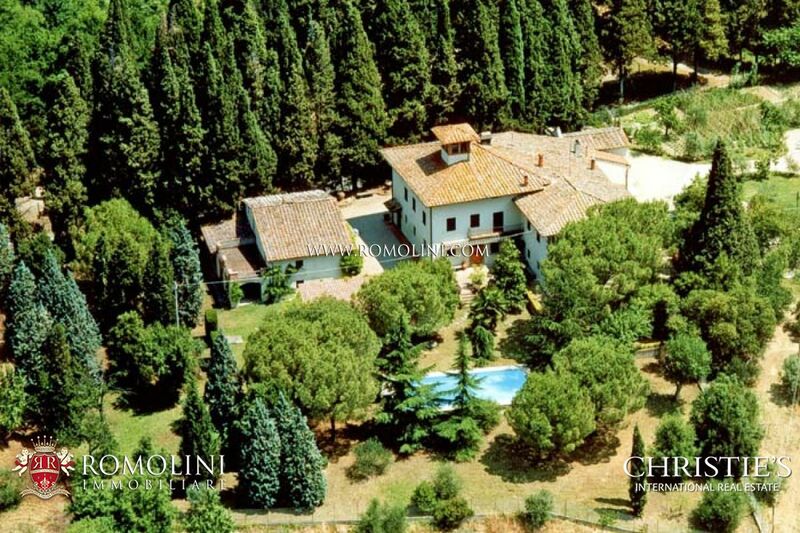 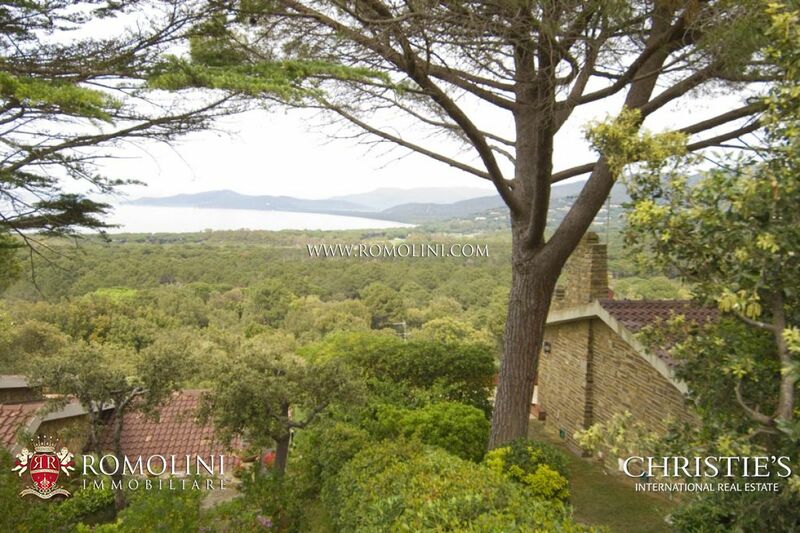 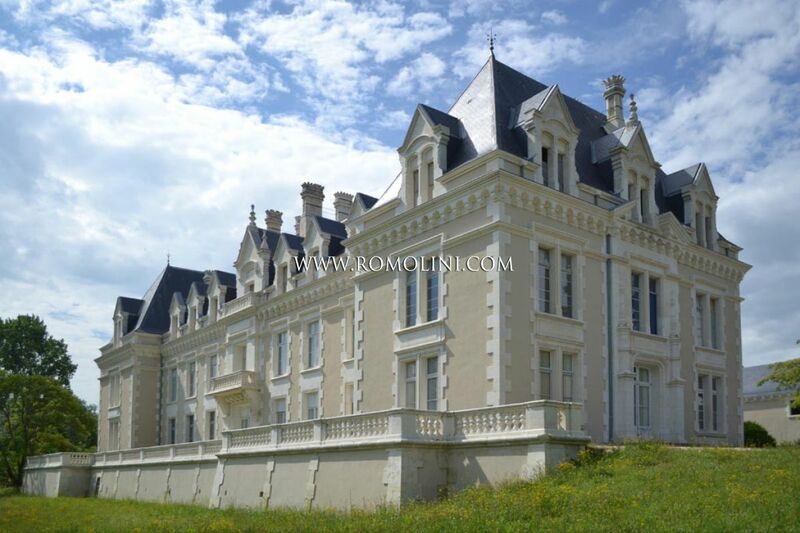 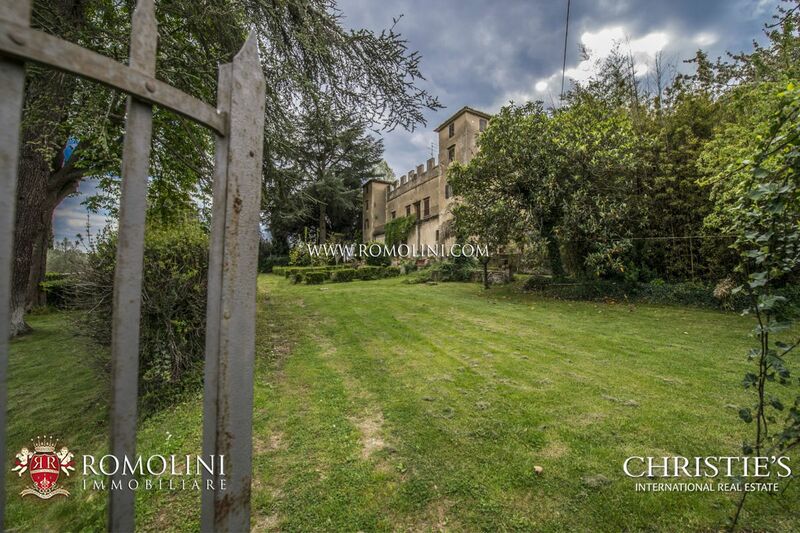 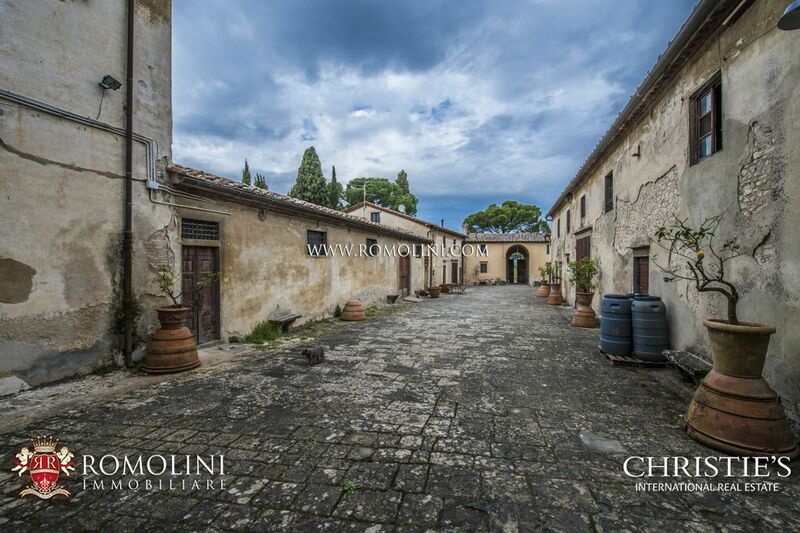 The property (3,264 sqm – 35,120 sqft) includes a huge manor villa and a medieval hamlet with a chapel. 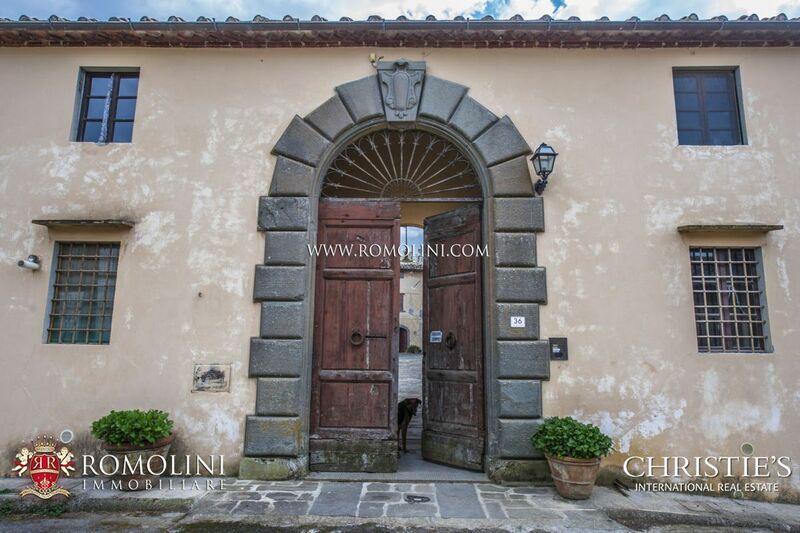 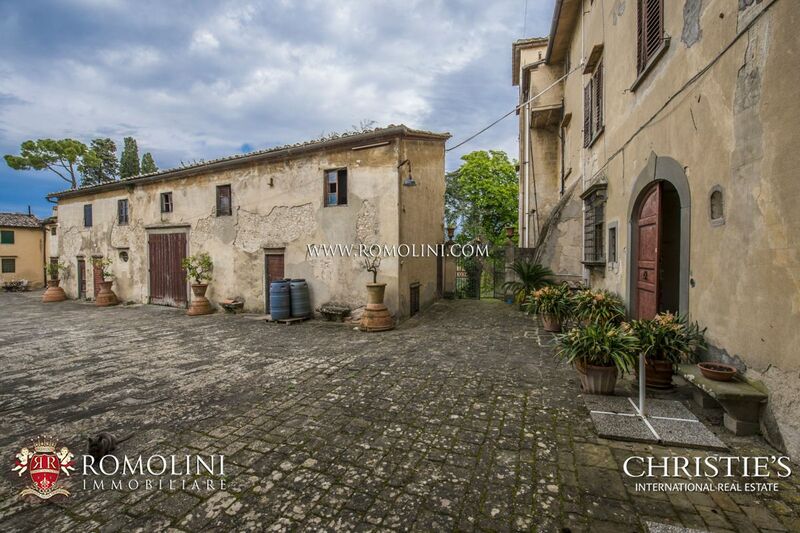 The access to the property is granted by great archway opening into the central courtyard, delimited on the side by the buildings of the hamlet, either rural or residential buildings, and at the end by the villa. 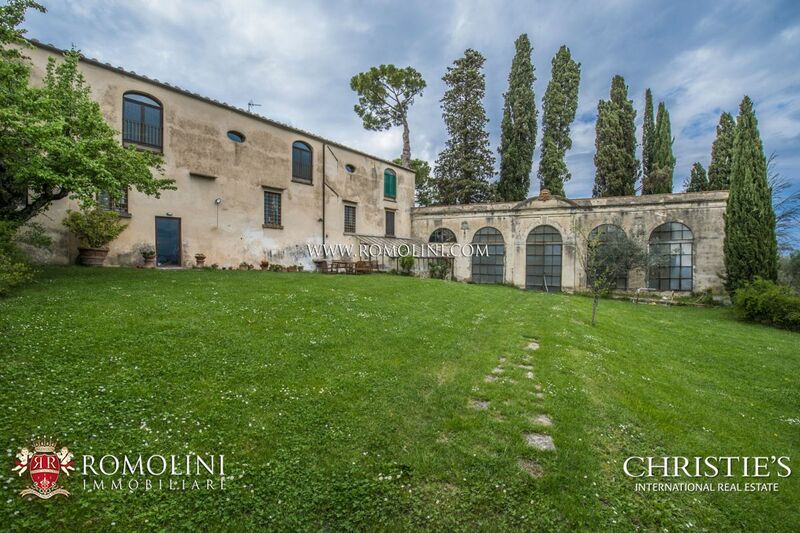 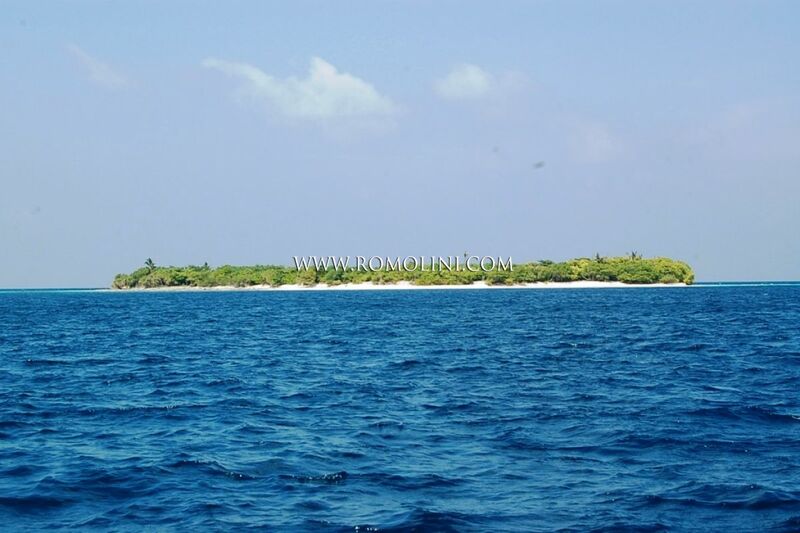 The villa (1,456 sqm) is the heart of the property and is laid out onto five floors (three above ground, one underground and one in the turrets). 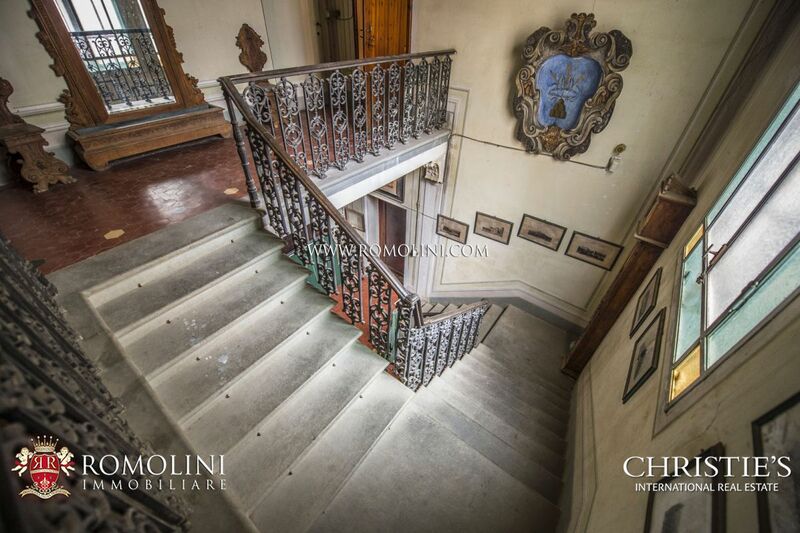 On the ground and first floors we find several locals originally intended for the noble family, while the third floor and the turrets were reserved for the servants. 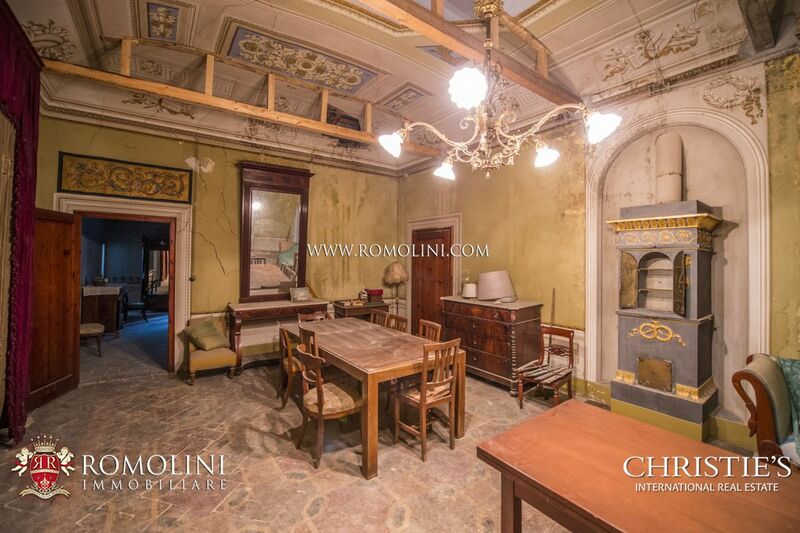 In the basement, nowadays as in the past, there are several storage rooms and various locals usable as cellar. 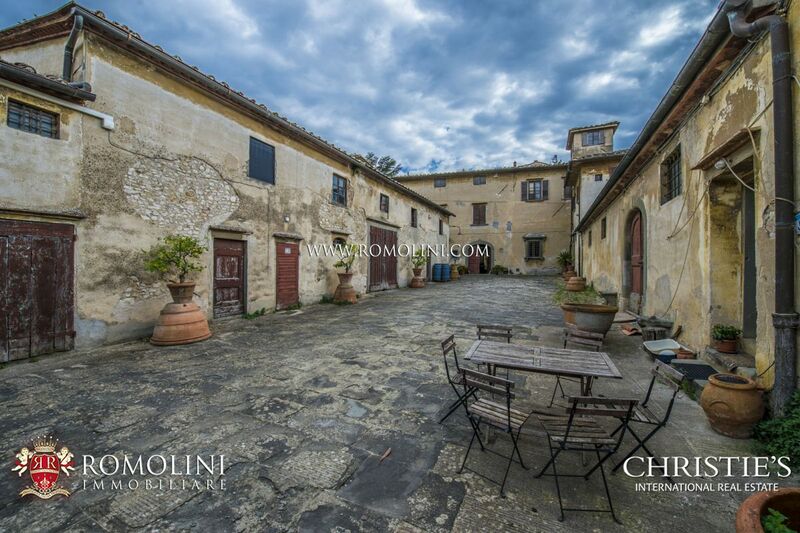 The hamlet (1,808 sqm – 19,454 sqft) around the villa is made up of several buildings once used as storage houses, workshops (cellars, farrier’s shop…) and living quarters for workers of the property. 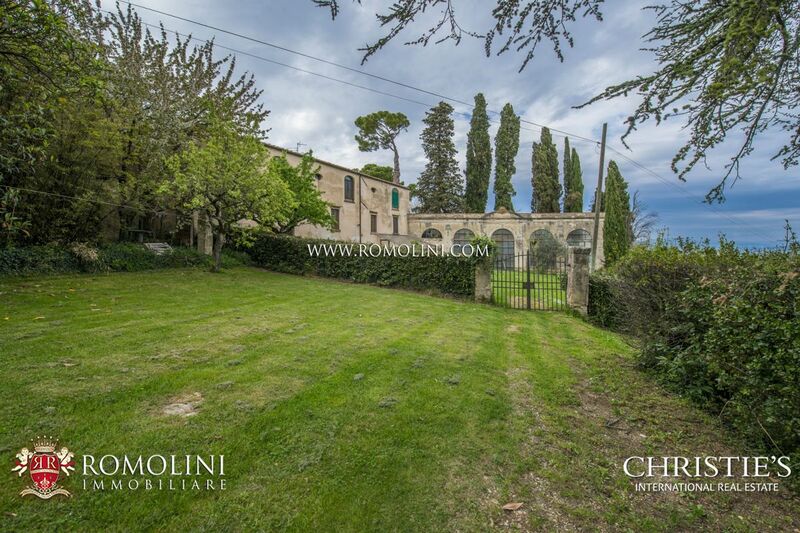 In the hamlet we can also find the beautiful 14th century chapel. 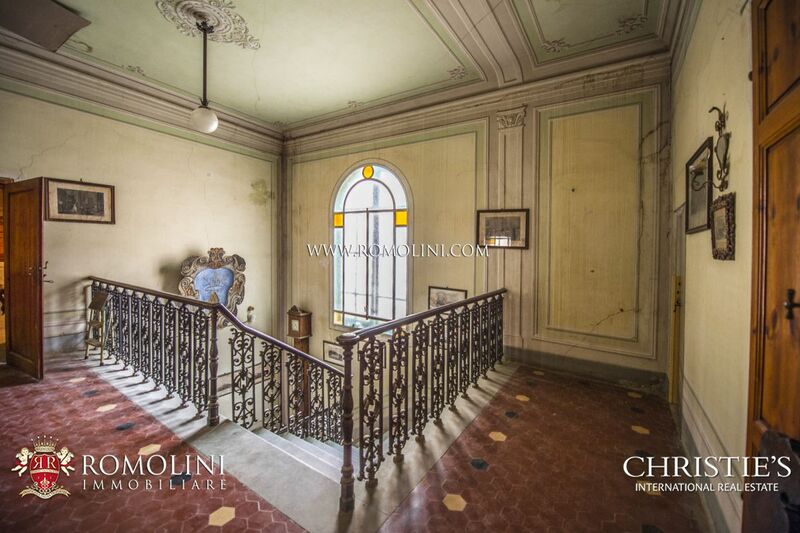 The property is in good structural conditions but several works are needed to bring the complex back to its original splendor. 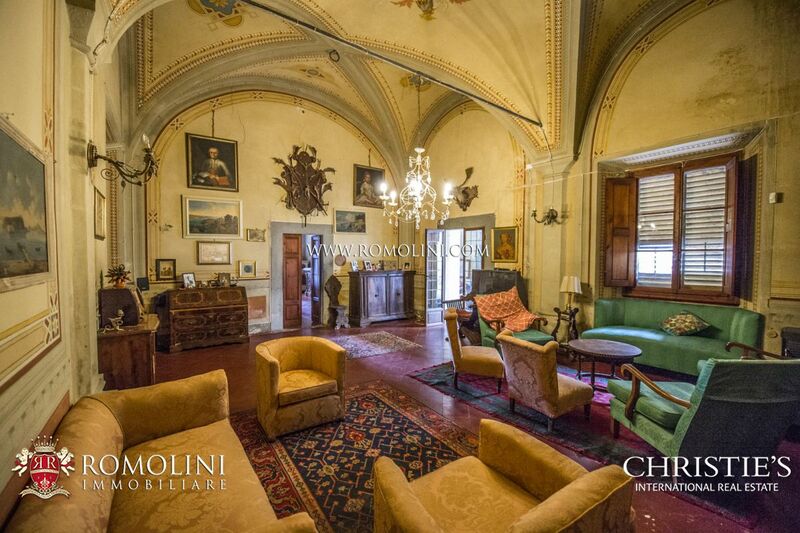 On the inside, the villa boasts numerous frescoes (the most ancient of which dates back to the 14th – 15th century) covering both walls and ceilings. 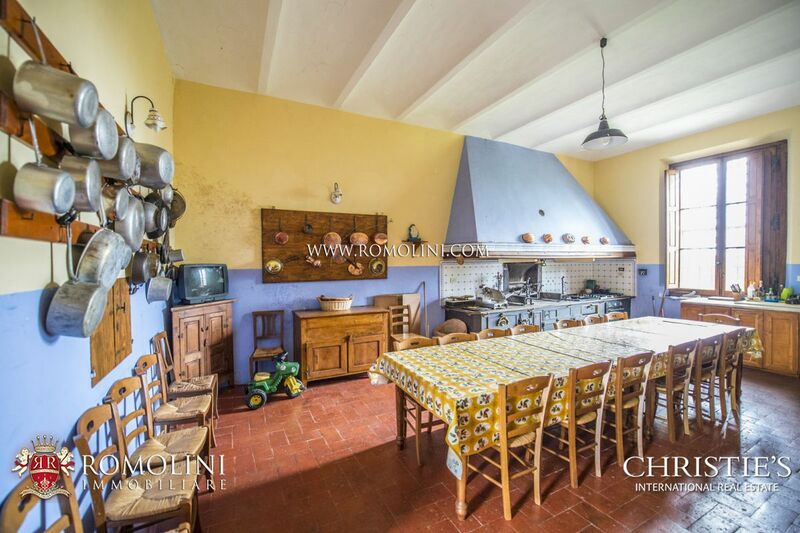 Terracotta floors are in good conditions, while walls need maintenance. 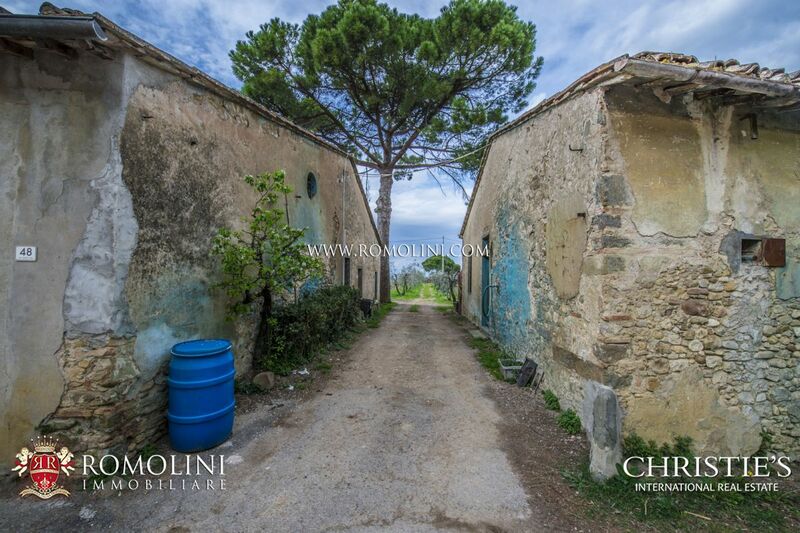 The building in the hamlet requires maintenance too to be usable again. 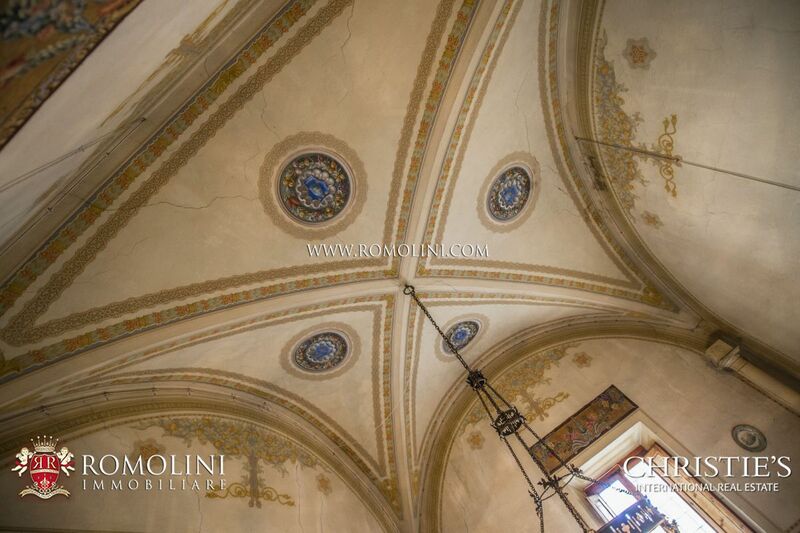 The chapel, perfectly preserved, boasts beautiful frescoes from the 14th century, with beautiful and complex decorations on the walls and surrounding the altar, windows and doors. 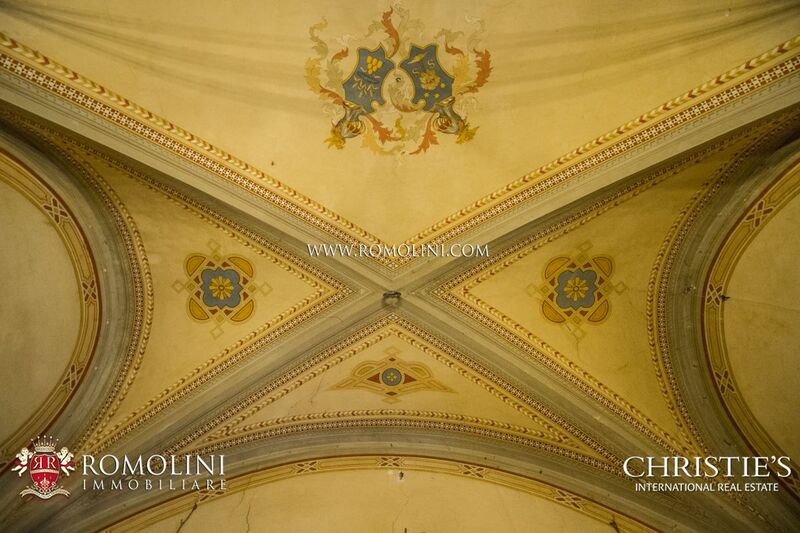 The roof is sustained by rib vaults, finely decorated with frescoes. 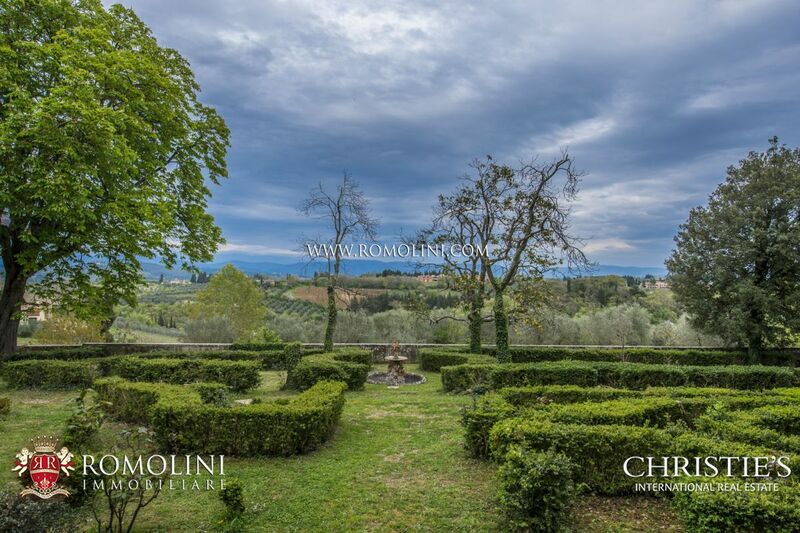 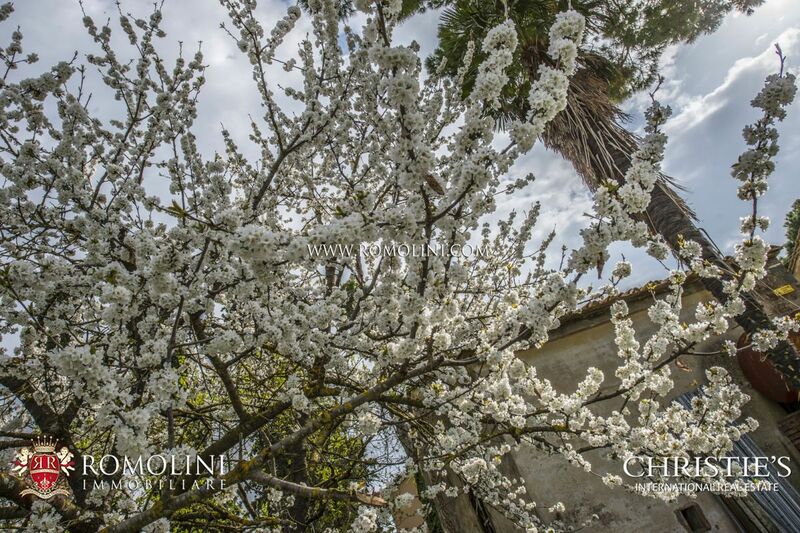 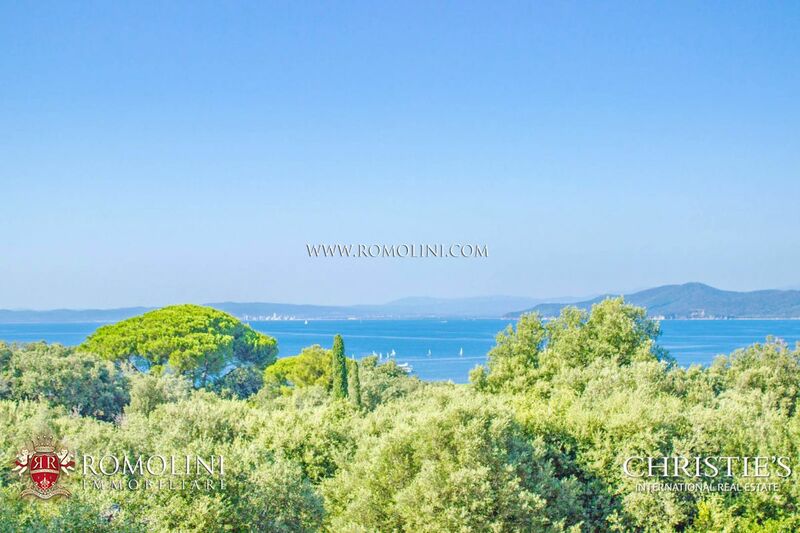 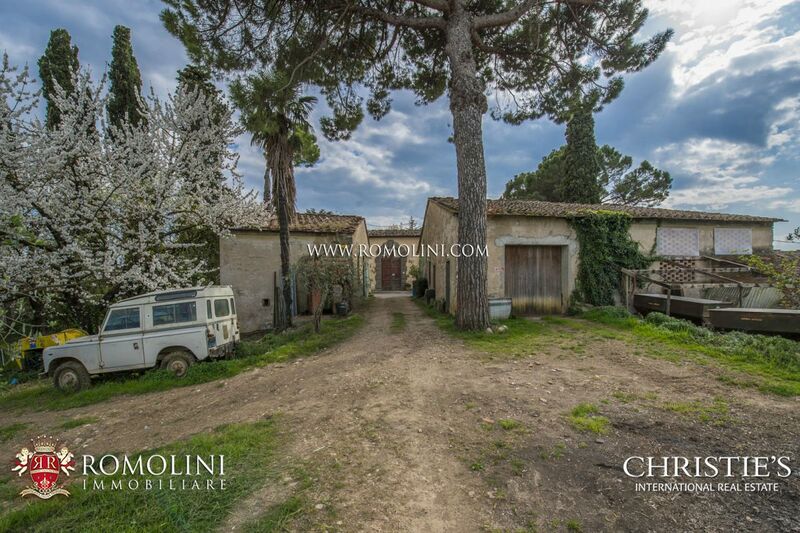 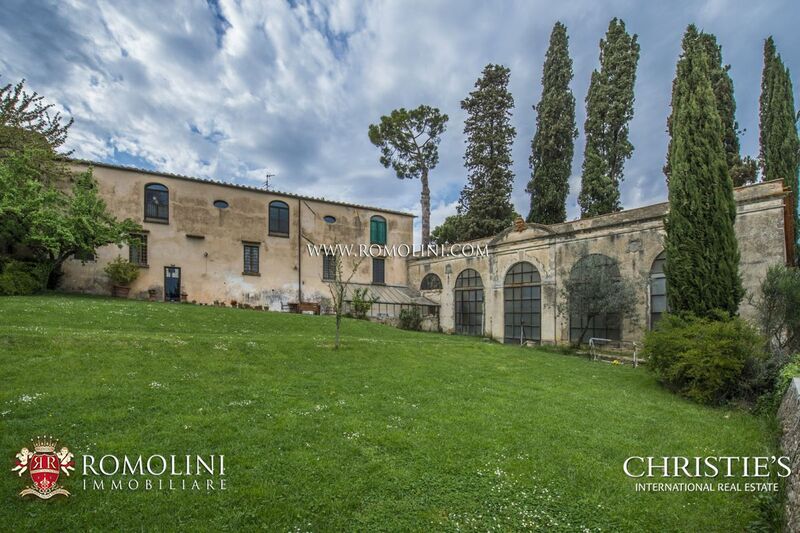 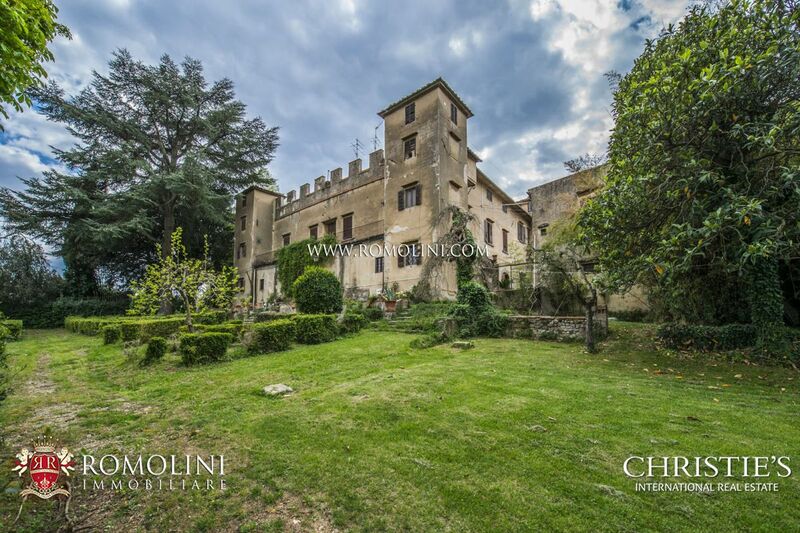 The property is surrounded by 2.2 hectares of land, which include a beautiful Italian garden decorated with hedges and fountains. 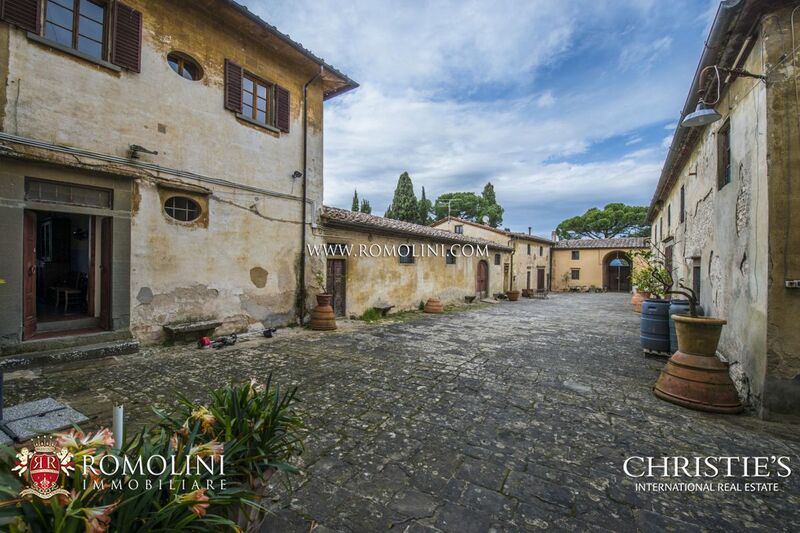 The complex surrounds a courtyard which grants access to every building in the property. 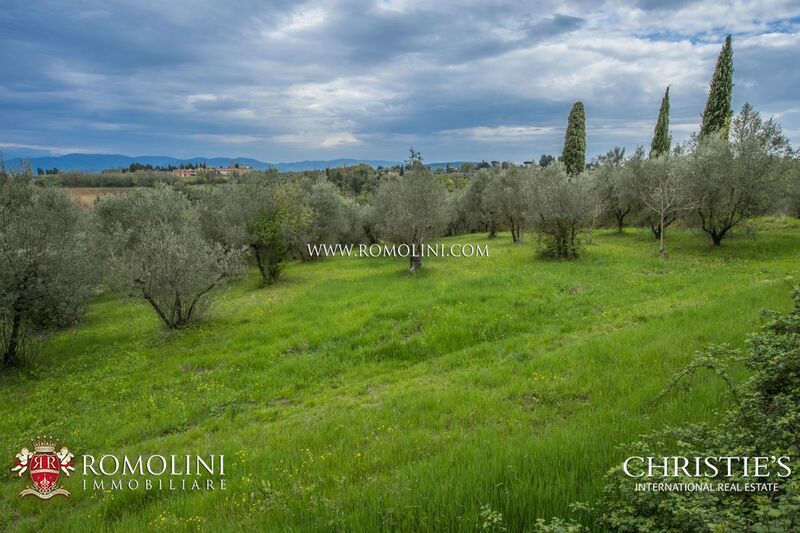 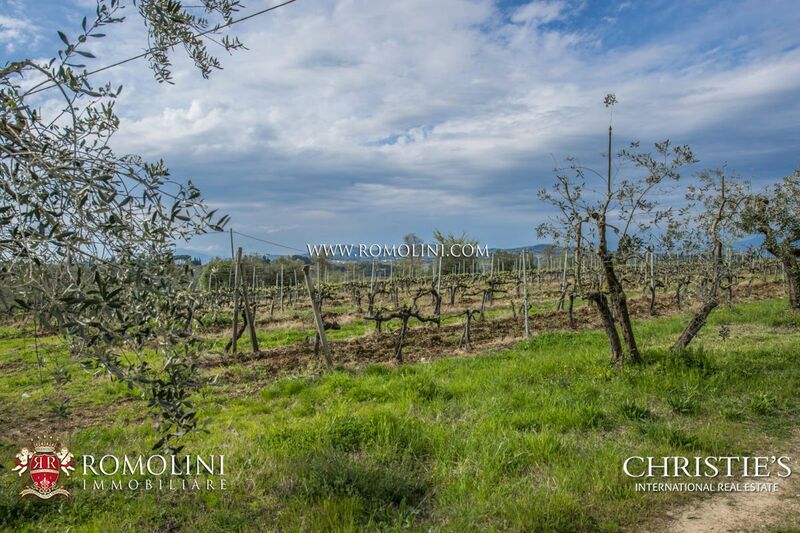 There is also an olive grove just outside the hamlet. 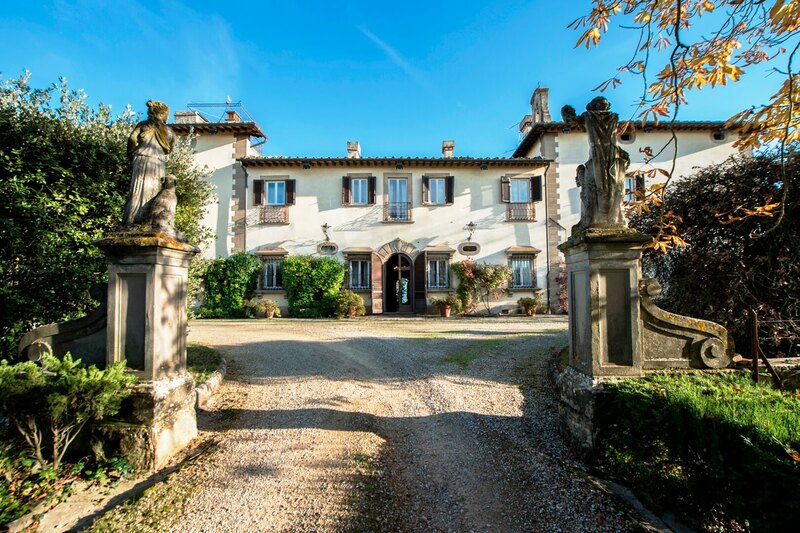 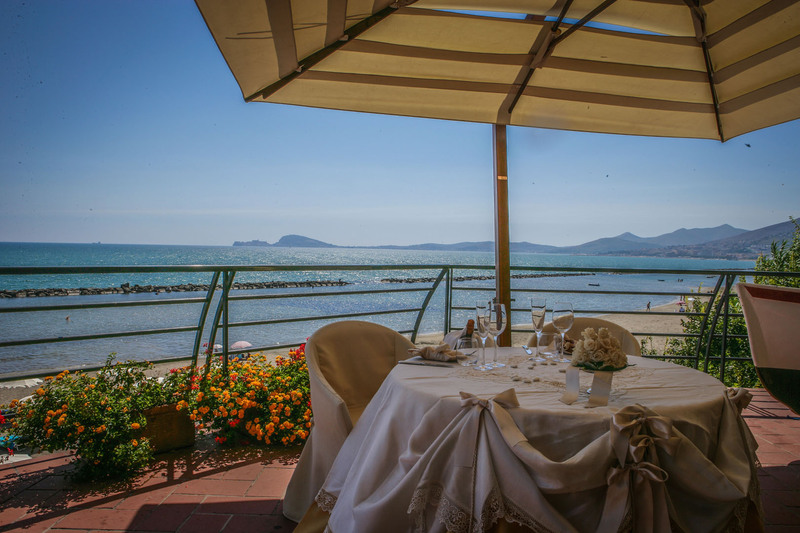 The property, thanks to its size, is perfect to start a hosting business, also given the exceptional location not too far from Florence. 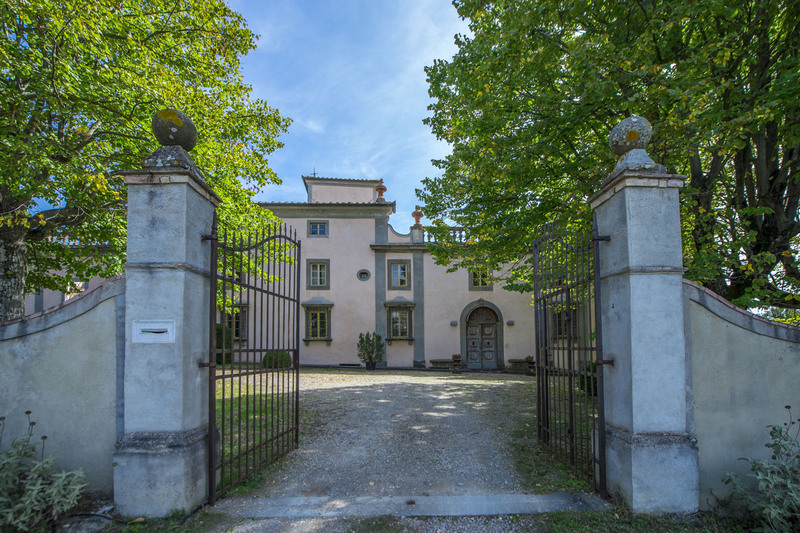 Alternatively, it is possible to use the manor villa as a private residence, earmarking the eventually inhabitable buildings in the hamlet to dependences for hosting guests.